2. 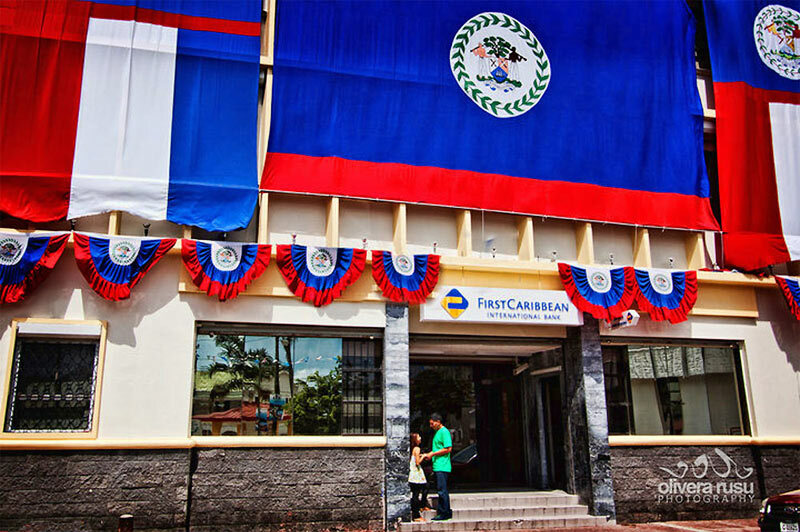 First Caribbean Bank decked out for Independence Day, 2010, in Belize City. Today is the 30th anniversary of Belize's Independence on September 21, 1981! The people and events which formed the nationalist movement of the 1940's and 1950's had a profound and poignant impact on the making of modern Belize. Much has been said and written of several characters of that time period - in particular, George Price and Philip Goldson who continued to make a name for themselves in Belizean politics. 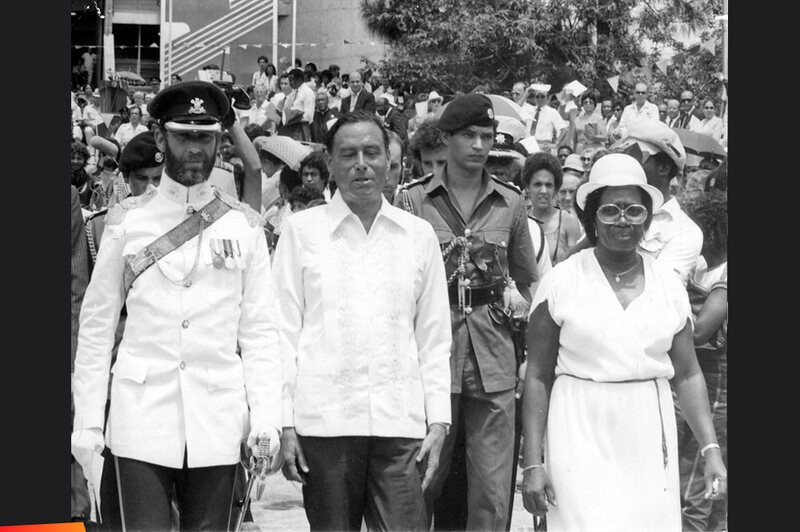 But of one unsung hero of that time period - Nicholas Pollard, Sr. whose leadership, oratory, passion, charisma, vision and love for his country and people contributed immensely to the development of modern Belize - the consequent political climate has mired his unselfish sacrifice for his country. In the early 1900s Belize nationalism emerged as the British colonial government continued to limit the legislative power of the local population, and the wealth and power were in the hands of the British colonialists. In 1935, Antonio Soberanis, led a public demonstration against his employer Belize Estate & Co., a British conglomerate which owned over 50% of private land holdings in British Honduras. In 1943, a group of bold local workers led by Clifford Betson, a shipwright, joined together to form the British Honduras General Workers Union (BHGWU) which became the backbone for the development of nationalist politics in Belize. In 1946, a group of Belizean nationalists including Nicholas Pollard, Sr., Leigh Richardson, Johnny Smith, Philip Goldson, Nacho Valdes, Edgar Gegg, Terence Keating and George Price formed the Christian Social Action Movement with the purpose of improving the rights and conditions of the worker through the principles of social justice. The Belize Billboard which was owned by Nacho Valdes at the time was a critical print medium for the nationalist movement. Nacho Valdes was later threatened with deportation by the British colonialists and sold the newspaper to Phillip Goldson and Leigh Richardson who were actively involved as writers and editors of the paper. In 1948, Nicholas Pollard, Sr. then a sales clerk at James Brodie & Co. formed the Mercantile Union for his fellow employees – the second trade union to be formed in the colony. The union purchased goods at wholesale prices and distributed the items at no profit to its members. On December 31st, 1949, the British governor used his extraordinary legislative powers and unilaterally devalued the Belize dollar. The following day, on January 1st, 1950, the members of the Christian Social Action Movement with Clifford Betson present dissolved its movement and formed the political People’s Committee. Clifford Betson declined to involve the British Honduras General Workers Union as a political vehicle for the People’s Committee with Johnny Smith as the leader. On January 6th, 1950, the People’s Committee led a huge demonstration at Battle Field Park condemning the British devaluation of the Belize dollar. Nicholas Pollard, Johnny Smith and George Price addressed the crowd. On April 23rd, 1950, the BHGWU held its annual general meeting to elect its new executive. The People’s Committee presented its slate of candidates and won the elections with Nicholas Pollard, Sr. as the new president of the BHGWU. Johnny Smith was elected vice president, Philip Goldson as assistant general secretary and Leigh Richardson and George Price as committee members. On September 29th, 1950, the People’s United Party (PUP) was formed with its critical membership and leadership taken from the BHGWU. Leigh Richardson was elected the leader of the PUP with Philip Goldson, Johnny Smith, and Herman Jex as executive members and George Price as party secretary. Pollard remained the leader of the BHGWU working to increase the party membership and promoting the party principles of Belize nationalism and social justice. Pollard, being of Belizean parents but having been born in Mexico, did not have British citizenship and could not hold political office. In 1951 Goldson and Richardson were arrested and tried for sedition against the British colonial government in connection with an article in the Belize Billboard entitled “Kingship and the People.” They were found guilty and sent to Her Majesty’s prison on Goal Lane in Belize City where they served nine months with hard labor and upon their release in August 1952 were received as heroes of the nationalist movement. (See historic photo of Goldson and Richardson upon their release below.) While Goldson and Richardson were on trial, Price was absent traveling abroad with his boss Robert Sydney Turton, and Johnny Smith had distanced himself in the wake of Goldson’s and Richardson’s imprisonment and the implicit British aggression and retaliation against the PUP leadership. At the same time Pollard had been offered a job by the American Trade Unions to travel and promote trade unionism in Central America and the Caribbean. The American job was paying US $200 per month, yet Pollard determined to take up the leadership of the PUP and the BHGWU for little or no financial compensation. At the same time, Pollard was married with his wife, Eleanor Elizabeth Pollard and four young children, Nicholas Jr., Elizabeth, Therese and Michael. Yet, Pollard made a big sacrifice to stay in Belize and ensure the success of the PUP and the nationalist movement. from prison in August, 1952. The conditions in the colony had worsened as the cost of living index was at $25.29 while workers received $18.60 per 48 hour work week without injury compensation. All attempts by the labor advisory board to negotiate increased wages with The Belize Estate & Produce Co. Ltd. and the United Fruit failed. On October 20th, 1952, the BHGWU launched its historical national strike which was led by Phillip Goldson, Leigh Richardson (both men had recently been released from prison), Herman Jex and Nicholas Pollard, Sr. It is to be noted that George Price who was president of the BHGWU in 1952 was absent from the strike. In 1954 the first national general elections under Adult Suffrage took place at the St. Mary’s Hall in Belize City where both the PUP and the National Party (NP) contested. Herbet Fuller and Johnny Smith contested on behalf of the National Party. Successful PUP candidates included Phillip Goldson, party leader Leigh Richardson, Herman Jex (president of the BHGWU in 1954 – union elections were held every two years), Enrique Depaz and George Price. For the first time in Belizean history, local Belizeans were elected (not appointed by the British governor) to the British Honduras Legislative Assembly. The Nationalist Movement had won a voice in the politic affairs of the colony. In December of 2001, Nick Pollard, Sr. sat down for a video interview. He talked extensively about his involvement in Belizean politics, credit unions, and trade unions. The interview has been edited into mini video segments for easy access and topic organization. As more segments are available they will be posted. Some video clips are presented using Real Media (Download Real Player), and some clips are presented using Flash video (you may be prompted to download the Flash player). Sept 21, 2011 HAPPY 30th BIRTHDAY BELIZE!